They're so much in love that they can't stand to be apart... not even for a few hours. Why torture them with a female-only bridal shower? Couples showers are growing in popularity and in my opinion, if planned right, can be a lot more fun than the traditional all-girls party. In fact, a summer shower can be turned into a backyard bash. Mixed company, mixed drinks and a mixture of gift and game types makes for a lot of laughs. So, go ahead and get the guys and gals together using one of our favorite invitations for a couples wedding shower in the summer. All of the featured invites come with a white envelope and a 100% satisfaction guarantee. Click on your favorites to learn more. 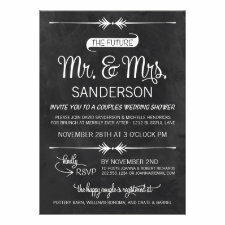 Pricing is determined by your choice of quality card stock and the amount of invitations you order. The more you order (over 25) the lower the price per invitation. You can choose a custom invite to match their color theme or choose something to match the type of party you're having for them such as a BBQ, wine tasting or pool party. Really, the party ideas are endless. 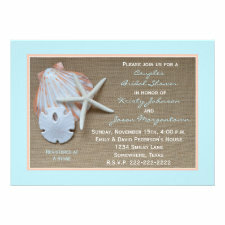 And all of the invitations can be customized and personalized to say anything you like. There are honestly way too many cute, trendy and popular designs to show you here. 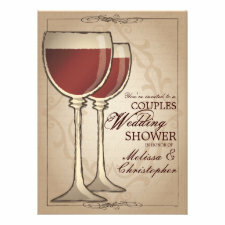 Visit Couples Wedding Shower to find the perfect one for the happy couple.